Up fairly early, we had a very nice free breakfast at the hotel. Given the size of Munich, the plan for the day was to take the Grey Line on and off bus to a number of sites. We walked to the subway station and took the subway to the Marienplatz stop. From there, we walked to the main railway station. We bought tickets and boarded a 10:20 am bus. The first stop was the Nymphenburg Palace. The palace is the main summer residence of the former rulers of Bavaria. We spent about 45 minutes touring the palace and the gardens. Jumping back on the bus, we got off at the BMW Welt (BMW World) and BMW Museum. 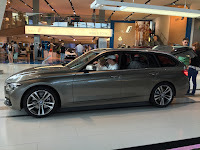 We wandered through the BMW World which is mostly current and future technology. Jack has been talking the whole trip about wanting a BMW station wagon. We saw them everywhere in Europe. 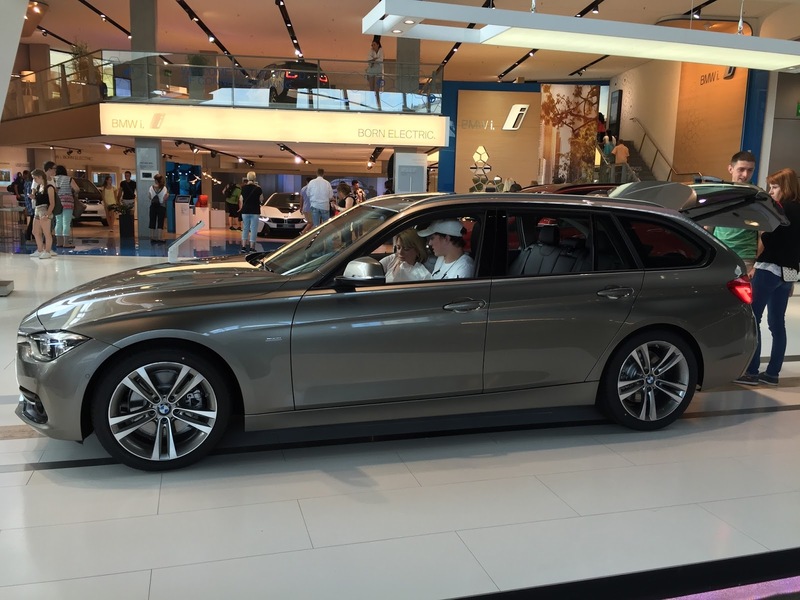 We then toured the BMW Museum which showcases the history of the company. I was astonished at the number of people; both sites were packed. Overall, we spent almost two hours between the two venues. The next bus stop was the English Garden. 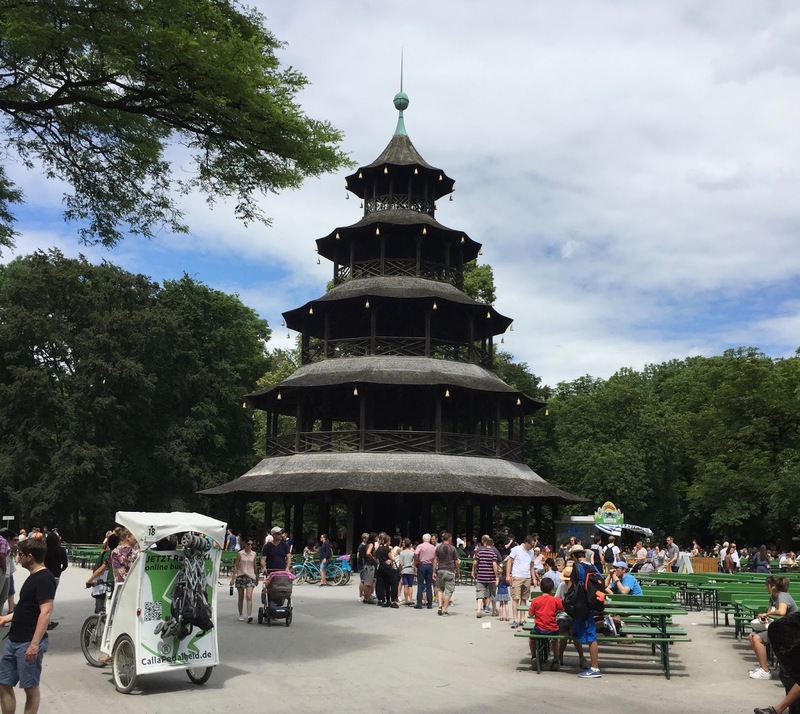 This is essentially Munich's equivalent to New York City's central park. We walked into the park and had lunch at the Chinese Tower beer garden. Afterwards, we walked the length of the English Garden. At the tip, people were actually surfing on the river where it came into the park. At this point, we started along the reverse direction of Rick Steve's walking tour of Munich. Struggling with a cold for the last couple of days, I was really starting to wear down at this point. We made a couple of stops to tour the Frauenkirche and St. Michaels Churches. We ended having a couple of good drinks in the Frauenplatz and watched an entertaining street performer. We had one odd experience in and around Munich. It seemed like they were more reluctant to take credit cards than everywhere else that we went in the two and a half weeks. There were a couple of places that wouldn't take cards and a couple of other places where they acted very bent out of shape when we used a credit card. We caught the subway back to the hotel. We headed down to the pool and the spa at the hotel. Unfortunately, it was a disappointment. The hot tub was not hot and the steam room was a far cry from the one at Hohenschwangau.